Gabon ( /ɡəˈbɒn/; French pronunciation: [ɡabɔ̃]), officially the Gabonese Republic (French: République gabonaise), is a sovereign state on the west coast of Central Africa. Located on the equator, Gabon is bordered by Equatorial Guinea to the northwest, Cameroon to the north, the Republic of the Congo on the east and south, and the Gulf of Guinea to the west. It has an area of nearly 270,000 square kilometres (100,000 sq mi) and its population is estimated at 1.5 million people. Its capital and largest city is Libreville. Since its independence from France in 1960, Gabon has had three presidents. In the early 1990s, Gabon introduced a multi-party system and a new democratic constitution that allowed for a more transparent electoral process and reformed many governmental institutions. Gabon was also a temporary member of the United Nations Security Council for the 2010–2011 term. Abundant petroleum and foreign private investment have helped make Gabon one of the most prosperous countries in Sub-Saharan Africa, with the 4th highest HDI and the third highest GDP per capita (PPP) (after Equatorial Guinea and Botswana) in the region. GDP grew by more than 6% per year from 2010 to 2012. However, because of inequality in income distribution, a significant proportion of the population remains poor. 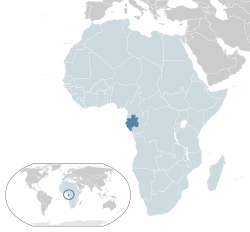 Gabon is located on the Atlantic coast of central Africa. Located on the equator, between latitudes 3°N and 4°S, and longitudes 8° and 15°E. Gabon generally has an equatorial climate with an extensive system of rainforests covering 85% of the country. 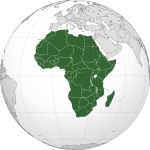 There are three distinct regions: the coastal plains (ranging between Template:Convert/Dual/LoffAonDsqbrSoff from the ocean's shore), the mountains (the Cristal Mountains to the northeast of Libreville, the Chaillu Massif in the centre), and the savanna in the east. The coastal plains form a large section of the World Wildlife Fund's Atlantic Equatorial coastal forests ecoregion and contain patches of Central African mangroves especially on the Muni River estuary on the border with Equatorial Guinea. Gabon's economy is dominated by oil. Oil revenues comprise roughly 46% of the government's budget, 43% of the gross domestic product (GDP), and 81% of exports. Oil production is currently declining rapidly from its high point of 370,000 barrels per day in 1997. Some estimates suggest that Gabonese oil will be expended by 2025. In spite of the decreasing oil revenues, planning is only now beginning for an after-oil scenario. The Grondin Oil Field was discovered in 50 m (160 ft) water depths 40 km (25 mi) offshore, in 1971 and produces from the Batanga sandstones of Maastrichtian age forming an anticline salt structural trap which is about 2 km (1.2 mi) deep. Gabon has a population of approximately 1.5 million. Historical and environmental factors caused Gabon's population to decline between 1900 and 1940. Gabon has one of the lowest population densities of any country in Africa, and the fourth highest Human Development Index in Sub-Saharan Africa. Almost all Gabonese are of Bantu origin. Gabon has at least forty ethnic groups with differing languages and cultures. The Fang are generally thought to be the largest, although recent census data seem to favor the Nzebi. Others include the Myene, Kota, Shira, Puru, and Kande. Ethnic boundaries are less sharply drawn in Gabon than elsewhere in Africa. There are also various Pygmy peoples: the Bongo, Kota, and Baka; the latter speak the only non-Bantu language in Gabon. Most ethnicities are spread throughout Gabon, leading to constant contact and interaction among the groups. Intermarriage between the ethnicities is quite common, helping reduce ethnic tensions. French, the language of its former colonial ruler, is a unifying force. The Democratic Party of Gabon (PDG)'s historical dominance also has served to unite various ethnicities and local interests into a larger whole. More than 10,000 native French live in Gabon, including an estimated 2,000 dual nationals. Major religions practiced in Gabon include Christianity (Roman Catholicism and Protestantism), Bwiti, Islam, and indigenous animistic religion. Many persons practice elements of both Christianity and traditional indigenous religious beliefs. Approximately 73 percent of the population, including noncitizens, practice at least some elements of Christianity, including the syncretistic Bwiti; 12 percent practice Islam (of whom 80 to 90 percent are foreigners); 10 percent practice traditional indigenous religious beliefs exclusively; and 5 percent practice no religion or are atheists. A vivid description of taboos and magic is provided by Schweitzer. Gabonese music is lesser-known in comparison with regional giants like the Democratic Republic of the Congo and Cameroon. The country boasts an array of folk styles, as well as pop stars like Patience Dabany and Annie Flore Batchiellilys, a Gabonese singer and renowned live performer. Also known are guitarists like Georges Oyendze, La Rose Mbadou and Sylvain Avara, and the singer Oliver N'Goma. Imported rock and hip hop from the US and UK are popular in Gabon, as are rumba, makossa and soukous. Gabonese folk instruments include the obala, the ngombi (Template:Separated entries), the balafon and traditional drums. The Gabon national football team has represented the nation since 1962. The Under-23 football team won the 2011 CAF U-23 Championship and qualified for the 2012 London Olympics. Gabon were joint hosts, along with Equatorial Guinea, of the 2012 Africa Cup of Nations, and the sole hosts of the competition's 2017 tournament. Gabon has competed at most Summer Olympics since 1972. The country's sole Olympic medalist is Anthony Obame, won a silver in taekwondo at the 2012 Olympics, held in London. ^ Department of Economic and Social Affairs Population Division (2009). "World Population Prospects, Table A.1" (PDF). Retrieved on March 12, 2009. ^ a b c d "Gabon". International Monetary Fund. http://www.imf.org/external/pubs/ft/weo/2016/02/weodata/weorept.aspx?sy=2016&ey=2021&scsm=1&ssd=1&sort=country&ds=.&br=1&pr1.x=73&pr1.y=7&c=646&s=NGDPD%2CNGDPDPC%2CPPPGDP%2CPPPPC&grp=0&a=. ^ "GINI index". World Bank. http://data.worldbank.org/indicator/SI.POV.GINI/. Retrieved 20 April 2016. ^ a b c "2016 Human Development Report". United Nations Development Programme. 2016. http://hdr.undp.org/sites/default/files/2016_human_development_report.pdf. Retrieved 21 March 2017. ^ a b Goma, Yves Laurent (January 26, 2011). "Gabon opposition leader declares himself president". Winston-Salem Journal. Associated Press. http://hosted.ap.org/dynamic/stories/A/AF_GABON?SITE=NCWIN&SECTION=HOME&TEMPLATE=DEFAULT. Retrieved January 26, 2011. ^ "The World Factbook". https://www.cia.gov/library/publications/the-world-factbook//fields/2116.html#gb. ^ Conrad Ouellon. "Le Gabon". Laval University. http://www.tlfq.ulaval.ca/axl/afrique/gabon.htm. Retrieved June 27, 2010. ^ Duval Smith, Alex (October 9, 2012). "Frosty relations with Hollande see Gabon break the French connection". The Independent. http://www.independent.co.uk/news/world/africa/frosty-relations-with-hollande-see-gabon-break-the-french-connection-8202897.html. Retrieved October 16, 2012. ^ "Gabon to introduce English as second official language". Xinhua. October 3, 2012. http://news.xinhuanet.com/english/world/2012-10/03/c_131886754.htm. Retrieved November 17, 2012. ^ "COUNTRY COMPARISON :: HIV/AIDS - ADULT PREVALENCE RATE". CIA World Factbook. https://www.cia.gov/library/publications/the-world-factbook/rankorder/2155rank.html?countryName=Lesotho&countryCode=LT&regionCode=af#gb. ^ "COUNTRY COMPARISON :: HIV/AIDS - PEOPLE LIVING WITH HIV/AIDS". CIA World Factbook. https://www.cia.gov/library/publications/the-world-factbook/rankorder/2156rank.html?countryName=Gabon&countryCode=gb&regionCode=afr&rank=59#gb. ^ "COUNTRY COMPARISON :: HIV/AIDS - DEATHS". CIA World Factbook. https://www.cia.gov/library/publications/the-world-factbook/rankorder/2157rank.html?countryName=Gabon&countryCode=gb&regionCode=afr&rank=52#gb. ^ "Gabon". CIA World Factbook. https://www.cia.gov/library/publications/the-world-factbook/geos/gb.html. ^ "Gabon: Gabon Fédération Gabonaise de Football". FIFA. http://www.fifa.com/associations/association=GAB/about.html. Retrieved 25 January 2017. ^ "Gabon will host the 2012 Africa Cup of Nations final". BBC. 29 January 2010. http://news.bbc.co.uk/sport1/hi/football/africa/8488241.stm. Retrieved 25 January 2017. ^ "Gabon named hosts of AFCON 201". CAF. 8 April 2015. http://www.cafonline.com/en-US/NewsCenter/News/NewsDetails?id=5EBYaO1Q3VpcNMG04lbrDA%3d%3d. Retrieved 25 January 2017. This page uses content from the English language Wikipedia. The original content was at Gabon. The list of authors can be seen in the page history. As with this Familypedia wiki, the content of Wikipedia is available under the Creative Commons License.